Christian Larsen's current exhibition “In Darkness, the Embrace of the Streets” displays recent paintings by Malmö-based artist Viktor Rosdahl. One in particular Ein, Zwei, Drei, 2010 can easily serve as a striking representative of both the dark climate and bleak temperament of Stockholm during winter. Using thick layers of textured ink on canvas expressing shades of white or pale grey on a dark grey or black background, Rosdahl is sensitive to both painterly detail and emotion. Miniscule brush strokes are detectable, suggesting an apocalyptic awe when considering the work's grand dimensions. One mood portrayed appears to be influenced by forces which are not in anyone's control, such as inevitable change, decay and regeneration found in nature, and perhaps unforeseeable mayhem or disaster. 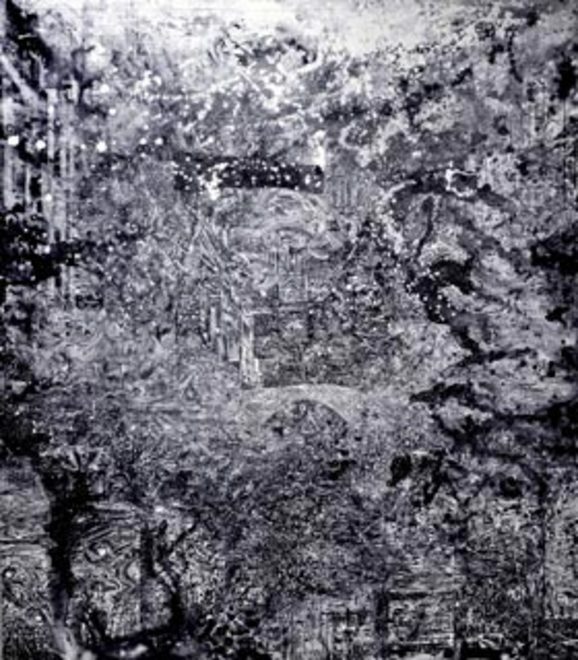 When taking a closer look at Ein, Zwei, Drei, 2010, one can discern that this is the faraway, aerial view of a cityscape clouded with atmospheric debris which could be snow, rain or chimney smoke, yet the air could also be heavy with unidentifiable matter associated with demolition or even military action. Rosdahl's decision to portray this anonymous city from a bird's eye view hints at his artistic ambition to draw additional attention to both familiar and well-masked societal concerns. His creation roughly manipulates the space which it occupies, leaving one hypnotized by its ethereal composition. The artist inspires an appreciation for the damaged, astray and mercurial—searching the city's scene, one detects abandoned streets and paths, cars and the outlines of seemingly unoccupied architectural structures. There is little to no human presence, hinting at feelings of abandonment or hindered communication caused by some exhaustive maelstrom. This work, among some of the others on display, follows Anselm Kiefer's stylistic approach (musty, large-scale) as in Seraphim,1983-84; Rosdahl also reflects the morally fueled yet chaotic composition found in earlier works such as Hieronymus Bosch's The Last Judgement, c. 1500. The Swedish artist claims both as creative influences.